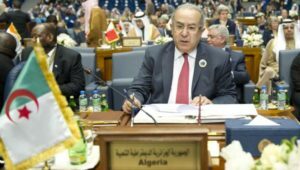 Algerian Foreign Minister Ramtane Lamamra has learned of his ouster of the new cabinet appointed on Sunday while he was attending the 30th Arab summit in the capital of Tunisia. Lamamra, one of the hawks of the Algerian regime, which is fiercely hostile to Morocco and its territorial integrity, was appointed diplomatic advisor to the President last February 14 and was promoted just 20 days ago to the position of Deputy Prime Minister and Minister of Foreign Affairs. But apparently, this Algerian career diplomat was not appreciated by the senior officers of the National Liberation Army and especially by chief of staff and deputy defense minister, General Ahmed Gaïd Salah, the current strongman who holds the reins of power in the country. Lamamra believed he was returning to his diplomatic business as usual and for a long time, after incumbent President Bouteflika decided not to seek a fifth term and to postpone sine die the presidential elections, thus extending de facto his current mandate. But Lamamra’s ambitions were quickly shattered. The former foreign minister had made of the Moroccan Sahara a focal point at his talks with foreign officials as well as at international or regional meetings, as was the case on Saturday (March 30) in Tunis. Actually, at a meeting with the UN Secretary General Antonio guterres, he brought up the Sahara issue, instead of limiting himself to topics on the agenda of the Arab summit: Palestine, Yemen, the Libyan and Syrian crises and the Golan Heights. The only consolation left to this “veteran” diplomat is the fact that he is not the only person in Algeria seeking to harm Morocco’s territorial integrity.